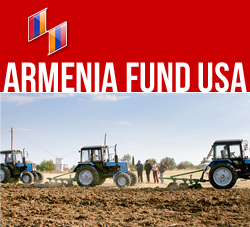 NEW YORK, New York — The Armenia Fund is building a community center in Mets Shen, a village in Artsakh’s Shushi Region. The project is co-financed by the Lebanese-Armenian community and donors in Armenia and Artsakh. Crews are currently constructing the columns of the second floor. When completed, the two-story, 195-meter-square community center will house the mayor’s office, a medical clinic, a library, and an events hall. The structure will also include a room for handicrafts and vocational training. The construction of the Mets Shen community center addresses a number of longstanding issues, for instance relieving key public institutions from having to operate in unsuitable quarters. Currently, the mayor’s office is housed in Mets Shen’s dilapidated telephone station, the clinic in the tumbledown hospital, and the library in a room of the community school. Mets Shen has never had a public events hall. One of the Shushi Region’s oldest settlements, Mets Shen has a population of 119, most of whom are seniors. The main occupations are bee-keeping, agriculture, and cattle-breeding. The village is renowned for the 17th-century Saint Panteleon Monastery, named in honor of a local physician for his life-saving work.